Stepping on legos and army men don’t bother me like they once did. A while back my folks got my oldest son a tackle box for Christmas, stocked with lures, and he was thrilled. Fast forward a few weeks. I had barely woken up, shuffling to the kitchen to brew a cup of Joe when I stepped on something. We step on a lot of things in this house of three boys under 7. This time was different. 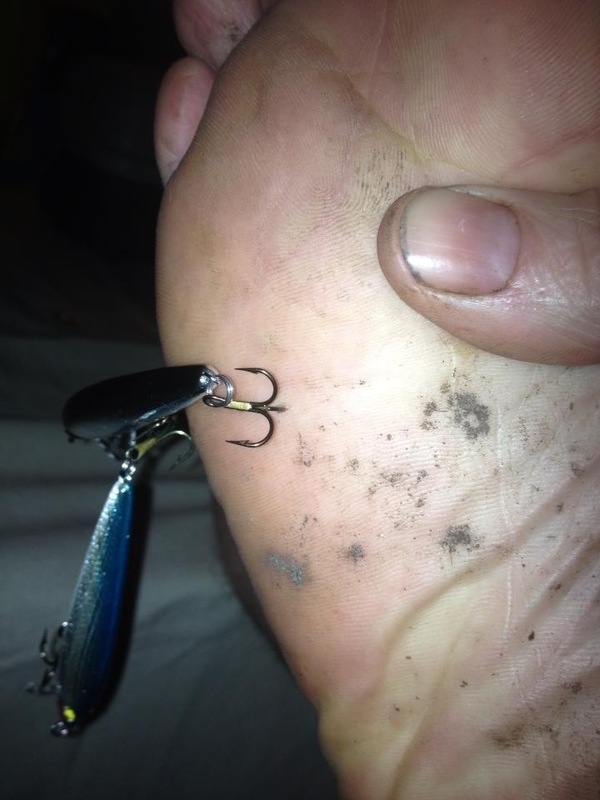 I looked down and discovered a miniature jerk bait firmly embedded in my foot. Both treble hooks buried to the hilt. One in the thick sole of my foot and the other in the thin skin just above the sole. None of the “tricks” to remove hooks work on tiny trebles. 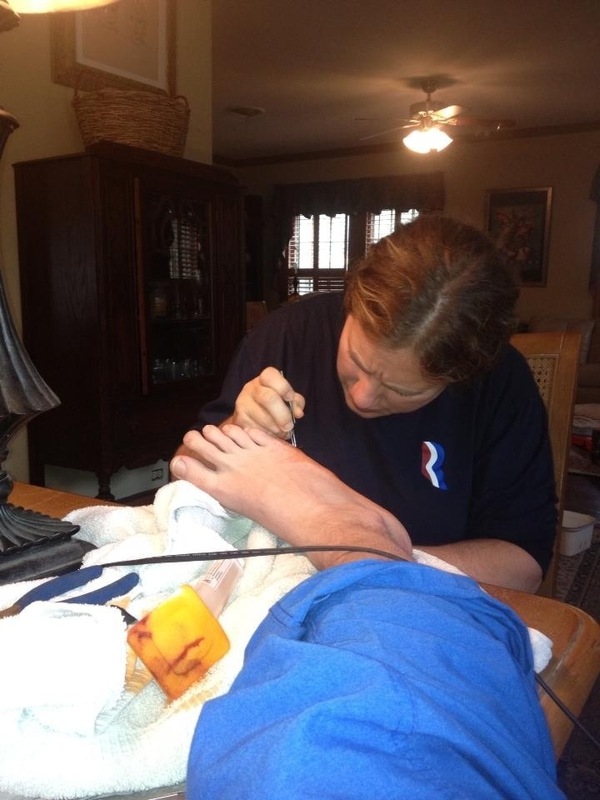 My wife had to perform surgery at the dinner table. She did admirably. So do you have any hook removal tricks? Sounds like a lot of fun. Did you use the lamp cord to tie your leg down so you couldn’t move? 🙂 Fortunately I haven’t had any hooks embed that deeply or seriously. I still remember I was watching a fishing show in high school and the host stuck a hook in his hand so he could show how to get it out. Not what I would have done, but I guess you do what you have to for ratings. Glad you are better. Did your son learn a lesson about not leaving lures out? Yes. And so did I! Oohhhhh man. My ole man use to crimp all my barbs……… after I hooked him……..a few times. Yeesh. My mom has a story about someone hooking her shoulder with a treble hook on the back of his cast. They pushed it up and though the skin again, clipped the barbed on off, and removed the rest. Over winter, one of my dogs was bumping into our ice fishing poles for some reason, and got the tiniest treble hook from a small jig in the skin of his hind leg. 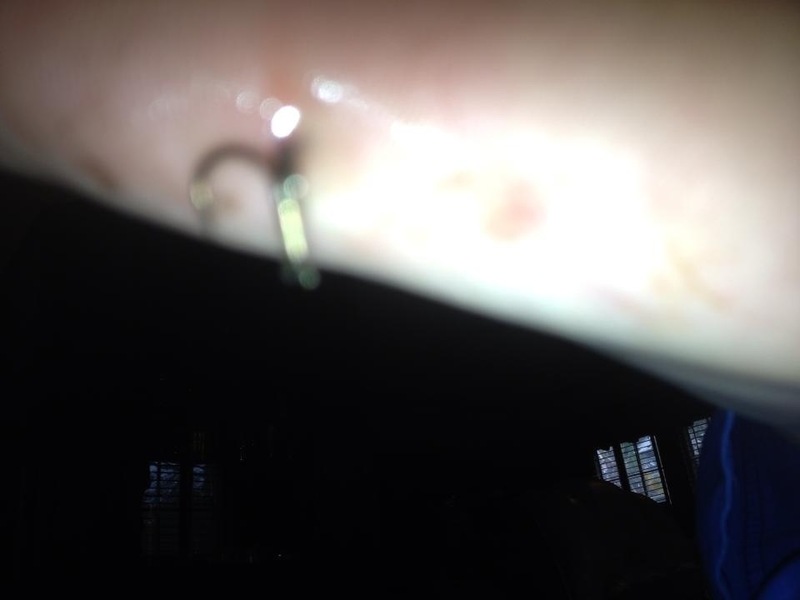 We did the same- pushed the hook through, pierced the skin, and clipped off the barb. That wouldn’t have worked for you, though. I keep hearing about a “string trick” and best I can tell, it’s just yanking it out still. It took lidocaine and some whimpering to get it out. Thankfully I’m fully recovered. The string trick is where you loop a length of line around the hook bend…and here’s two critical things…make sure the string/fishing line is strong, because you are going to count to three and pull the string and yank the hook out backwards…So it’s ONE, TW(yank! )OOO…there never comes a three. Yank it before the person tenses up.